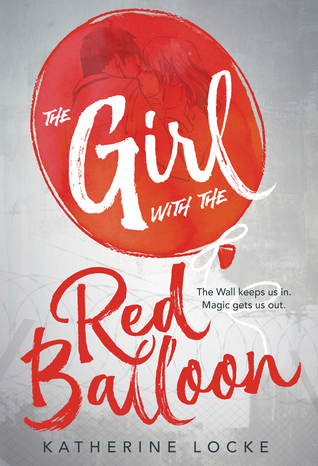 The Girl with the Red Balloon is a YA urban fantasy time travelling novel set in Berlin. Well, I don't know about you, but I'm sold based on that concept alone. Ellie Baum, an American Jewish teenager, visits 21st century Berlin on a school trip, excited but slightly apprehensive as she recalls her grandfather's Holocaust-formed apprehensions about the German people. She spots a floating red balloon, and, recalling grandpa's description of beautiful days as "balloon days", asks her friend to take a photo of her as she grabs it... and, touching it, is pulled into night-time 1980s East Berlin. There, she meets a gypsy boy, a lesbian counterculture girl, and a conspiracy to smuggle persecuted people out of East Germany by means of magical balloons. Time-travel, it turns out, had not been a part of the plan. The book is rich in atmosphere and detail - clearly, Katherine Locke has visited Berlin, and read up about history. It's also obvious that she knows a little German (but isn't at native-speaker-level), as she sprinkles German words and phrases into the book. The latter works up to a point: for any non-German-speakers, it undoubtedly adds to the richness of the details. To native speakers, her choice of words jars a bit, especially the repeated use of "Schöpfers", meaning "makers". Unfortunately, "Schöpfer" is used almost exclusively to refer to God as the creator. Similarly, her attempt at a compound noun is a bit befuddled. When it comes to describing East Germany (and, in flashbacks to history, Jewish ghettos and concentration camps), the story feels grim and very claustrophobic. There's no way around the grimness for the scenes set in the Holocaust, but my impression is that the grimness of the DDR may well be overplayed in the novel. Germany is an odd case - because it reunited the communist, dictatorship East with the liberal democratic West, the transition was different from other countries. Because of the WW2 history, (West) Germany has a very self-conscious approach to looking at its history - so there are museums and memorials and movies about the horrors of the DDR. Other 'East European' countries also transitioned from Communist dictatorships to democracies, but didn't necessarily put the same amount of money, effort and cultural navel-gazing into looking at their past regimes. The result is perhaps a distortion of perception: Life in East Germany was no walk in the park, but it wasn't more terrible than life in any other country behind the Iron Curtain. That said, Ellie being an English-speaker behind the Iron Curtain, she has to spend much of her time in hiding, forcing a claustrophobic tension into the story that feels warranted and authentic. Perhaps East Germany feels extra grim partially because of the culture shock and contrast she experiences. While much of this review details the aspects of the novel that made me bristle a little, I would nonetheless recommend it. It's a good, exciting story, with shedloads of atmosphere and enough authenticity for most readers. If you were alive during the Cold War, or if you're a German native, you might find some things to quibble over, but if neither of those statements applies I suspect you'll enjoy the setting, atmosphere, detail and tension of the book.